Robert Michael Coplans was born on 22 April 1911 in Headingly, Yorkshire, United Kingdom and was educated at St Paul's School (London), Middlesex Hospital and London University. He served as a Surgeon Lieutenant Commander in the Royal Navy during October 1939-November 1946 at sea in the Atlantic and ashore in England in Royal Navy Hospitals that were subjected to German air raids. He was demobilised from Royal Navy in 1946 and joined the RAN on 15 November 1948, at the Australian High Commission in London, as a Surgeon Lieutenant Commander on a short service commission. Following his arrival in Australia in March 1949 he was appointed as the Senior Medical Officer and the inaugural Officer in Charge of the School of Air Medicine at HMAS Albatross. Coplans served at the Naval Air Station for the next six years and was promoted surgeon commander on 31 December 1953. As the result of suffering infantile paralysis as a youth he had a mild speech defect and was affectionately nicknamed ‘Mumbles’. The RAN’s aviation capability was in its infancy when Coplans joined Albatross and with him playing a significant role in creating the School of Air Medicine (later the School of Aviation Medicine) and its outfitting with the necessary equipment, specialist drugs, staff training and procedures. Coplans was also a hygiene specialist and employed occasionally at HMAS Tarangau (Manus Island) advising on procedures to reduce malaria and improve the quality of fresh water at the base. During his service at Albatross there was a spate of fatal motorcycle accidents on base and on the main road leading to the base. Robert Coplans quickly assessed the main cause of death was due to head injuries and implemented the policy that helmets must be worn when on the base or proceeding or returning from leave; this had the effect of significantly reducing the number of fatal motor cycle accidents and was implemented some years before it became NSW state law. He was tireless in his efforts to improve the RANs aviation medicine skills and even had some medical staff qualified as divers to assist with the recovery of downed aircrew at sea. Surgeon Commander Coplans joined the aircraft carrier HMAS Vengeance on 29 April 1955 as the Senior Medical Officer. In June that year the carrier returned to England reverting to Royal Navy service and her ship's company transferred to the new RAN carrier Melbourne. On 25 October 1955 Vengeance decommissioned at Devonport and three days later her crew commissioned HMAS Melbourne with Coplans as Senior Medical Officer and Fleet Medical Officer. Melbourne underwent extensive flying trials in UK waters until January 1956 and then sailed for Australia, via the Suez Canal, and reached Sydney in May. The carrier then underwent a brief refit before more flying trials and a deployment to Singapore, Hong Kong, Manila and New Guinea during September-November. Coplans returned to Albatross in early January 1957 as the Senior Medical Officer and Officer in Charge of the School of Air Medicine. During this period he also completed the Combat Survival Course at the Jungle Training School Canungra qualifying as an instructor. 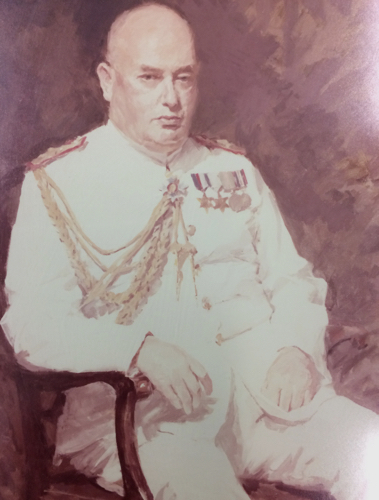 In September 1958, Coplans was promoted Acting Surgeon Captain and appointed as the Medical Officer in Charge Flinders Naval Hospital (HMAS Cerberus). He was confirmed in the rank of Surgeon Captain on 30 June 1959 and was also appointed as Honorary Physician to the Governor-General during this period. His next posting was as Medical Officer in Charge Balmoral Naval Hospital (HMAS Penguin) and Command Medical Officer East Australian Area during January 1963-January 1964. These two postings were exceptionally busy as he oversaw the health care of the bulk of the RANs personnel at the Navy’s two main hospitals. He was appointed to Navy Office (in Melbourne where the Medical Branch remained throughout the 1960s) as Medical Director General of the RAN in January 1964 and was promoted Acting Surgeon Rear Admiral on 20 April 1965. Coplans was confirmed in the rank of Surgeon Rear Admiral on 26 May 1967. During his tenure he oversaw the reinvigoration of the RAN Nursing Service and broadened health support as new platforms including guided missile destroyers, submarines, a tanker and patrol boats joined the fleet. Surgeon Rear Admiral Coplans was made a Commander of the Order of the British Empire (CBE) in the Queen’s Birthday Honours List 1969 for services to the RAN as Director-General of Medical Services. He was also Honorary Physician to Queen Elizabeth during his service as Medical Director General. Robert Coplans retired from the RAN in 1971 and was employed as a consultant to WD & HO Wills Australia, Ltd during the period 1973-83. Surgeon Rear Admiral Robert Michael Coplans died in Melbourne, Victoria on 5 May 1989 and was buried at Springvale Cemetery. His wife Anne Helena Coplans had pre-deceased him in November 1979.